Yesterday, the US Fish and Wildlife made two important announcements about trophy hunting. The good news is that the Service extended a ban on imports of sport-hunted elephant trophies from Zimbabwe, where an autocratic ruler has made a mess of the resource-rich nation's wildlife management program. Extending the ban is the right move, not only because the wildlife programs of several nations with elephants are weak, but also because of the larger poaching crisis that elephants are experiencing. When the US is trying to rally the nations of the world to crack down on the mass slaughter of elephants, it sends the wrong signal to grant special privileges to trophy hunters to start picking off elephants for the thrill of it. If it's wrong for a poor African to shoot an elephant for his tusks for profit, why should it be okay for a rich American to shoot an elephant for his tusks for the purpose of display? That leads right into the bad news. The Service has granted import permits to two trophy hunters who have had a long-held lust to kill rhinos for their horns. They've agreed to pay Namibia a big sum for the privilege, and both that government and ours are in on the deal. There are only 4,880 black rhinos left in the world, and they are critically endangered. One of the trophy hunters, Michael Luzich, is managing partner at Luzich Partners, LLC, a Las Vegas-based investment firm. Mr. Luzich is a member of the National Rifle Association Golden Ring of Freedom, which requires a minimum donation of $1 million to the NRA to gain entry. He already killed a male rhino in Mangetti National Park in northeastern Namibia, even before he knew he would be able to import the trophy. The other trophy hunter, Corey Knowlton, infamously "won" an auction, put on by Dallas Safari Club in January 2014, to hunt a black rhino in Namibia, for which he agreed to pay $350,000. 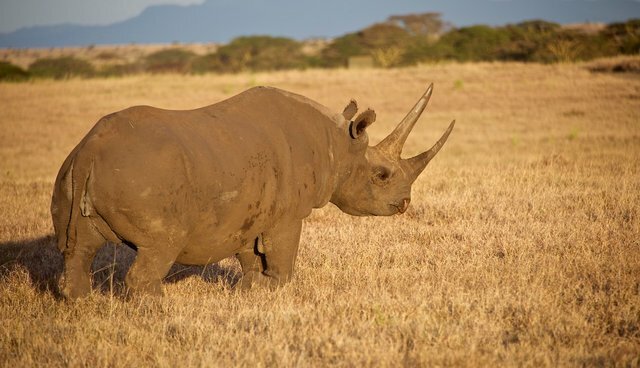 Mr. Knowlton, a professional trophy hunter who sets up hunts for others and who appears on the Outdoor Channel show, Jim Shockey's The Professionals, stated that without the Service's issuance of the import permit he would not hunt the black rhino. Included in his import permit application materials was a grim report by a Mangetti spokesperson stating that Mr. Knowlton would be able to choose from two bulls, Bull C and Bull D, who were selected to be killed because they were "old." The federal government would not allow the shooting of a free-roaming endangered species in our country, and most certainly not in one of our national parks, where any hunting is generally forbidden. But somehow, we're giving the nod to do it in Namibia. As a legal matter, the Service can issue such import permits only if the import "enhances the survival" of the species. In a statement, the Service claims that importing the trophies will benefit the species because removing older males "may provide the opportunity for younger, less dominant males to reproduce, leading to a possible population increase." This statement is biologically indefensible. Biologically, both young and old males are capable of producing offspring and the number produced is dependent on the number of females, not the age of the males; and older male black rhinos have, by their very survival, demonstrated they are the most genetically fit and should therefore be the ones to pass their genes on to future generations. This "old bull" language is baseless and it's part of the false framing efforts from the Safari Club. The Fish and Wildlife Service should know better than to repeat it. The Service also infers that money generated from these hunts, $550,000, will be used for anti-poaching, conservation, and community development projects and that these will enhance the survival of rhinos. But there is no evidence that funds from previous hunts of black rhinos in Namibia have been used to demonstrably enhance the survival of the species. As a legal matter, the Service cannot demonstrate that killing these rhinos will enhance the survival of the species and therefore should not have agreed to issue the permits. Beyond these biological and legal matters are ethics and matters of moral consistency. As with elephants, our nation is leading the effort to stop poaching of these largest of land mammals in the world – telling poor Africans and others not to kill these animals for their tusks and horns. Isn't it an extraordinary inconsistency to demand an end to killing while enabling Americans to target these rhinos? What will Africans asked to help with the anti-poaching efforts think? This narrow-minded, one-off thinking is an embarrassment, and it undermines the broader conservation efforts we are trying to serve. And where does this pay-to-slay line of thinking end? Are all of the world's rarest species up for grabs at a Safari Club auction? Is the Fish and Wildlife Service going to grant eager hunters the opportunity to shoot orangutans, chimps, and gorillas next if they pony up enough money? How about Siberian tigers, Asian elephants, and cheetahs? Can we do unethical things to the rarest of the world's most magnificent animals if we pay enough money? And let's not lose sight, in all of these larger arguments, of Bull C and Bull D. Does one of them need to die at the hands of a man who's been given many blessings in life, but doesn't know well enough to limit his taking and killing? These rhinos are sentient animals living peaceful lives, eating, sleeping, breeding, and going about their business. Thankfully they are unaware of the self-congratulatory and selfish plans of a person who wants to travel halfway around the world for the thrill of shooting a creature about as difficult to stalk as a parked bus.